Intertops Casino has just started another massive casino bonus event. This time we're diving into the crystal clear waters of the Caribbean for $30,000 in treasure awarded every week. 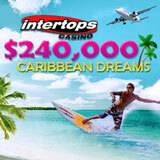 During the $240,000 Caribbean Dreams casino bonus event, 300 players will get bonuses up to $500 every week. If you play early in the week you'll qualify for more bonuses awarded randomly on Thursdays. Get casino bonuses up to $500 during summer casino bonus offer. Intertops Casino, one of the most trusted online casinos in the world, has hundreds of casino games from RTG (Realtime Gaming) as well as poker and sports betting.